High explosives (including blasting caps, detonating cord, dynamite, shaped charges, boosters, etc.) must be stored in ​Type-1​ permanent magazines. Blasting agents stored ​with​ high explosives must be stored in ​Type-1​ or Type-2 magazine. Low explosives must be stored in Type-1​, -2, or -4 magazines. Foundation Brick, concrete, cement block, stone, or wood posts. If piers or posts are used in lieu of continuous foundation, the space under buildings must be enclosed with metal. Strong enough to bear maximum storage weight and non-sparking (pallets constructed of, or covered with, non-sparking material is acceptable). Masonry Wall Brick, concrete, tile, cement block, or cinder block no less than 6” thick. Hollow masonry spaces filled with well-tamped, coarse, dry sand or weak concrete (1 part cement to 8 parts sand with water to dampen while tamping). Metal Wall Fabricated sectional sheet steel or aluminum (no less than 14-gauge) securely fastened to metal framework. Interior walls lined with brick, solid cement blocks, hardwood (no less than 4” thick) or at least 6” sand fill between interior and exterior walls. Interior Walls (Masonry and metal walls) Constructed of, or covered with, non-sparking material. Ferrous metal nails in floor and walls must be blind nailed, countersunk, or covered with non-sparking material. Wood Wall Exterior walls must be covered with iron or aluminum no less than 26-gauge. Inner walls must be covered with non-sparking material constructed to provide at least 6″ space between outer and inner walls. Space filled with coarse dry sand or weak concrete. side walls and ceiling must have a wooden lattice lining (or equivalent) to prevent stacking explosives against walls. Roof (bullet-resistant ceiling /roof) For buildings without fabricated metal roofs, outer roof must be covered with no less than 26-guage iron or aluminum, fastened to at least 7/8″ sheathing. ● For roofs not of fabricated metal, outer roof must be covered with no less than 26-guage iron or aluminum, fastened to at least 7/8″ sheathing. at least 24” on top, sides and rear. Interior walls and floors must be constructed of, or covered with, non-sparking material. Sources: ATF Publication 5400.17 (May 2016) and atf.gov. Learning what the proper way to store ATF regulated 1.3G Fireworks is the best way to stay in compliance for safety in storage magazines. In general, there are three main types of commercial fireworks. These three categories of devices are closely regulated by several government agencies, with special focus on the the Department of Alcohol, Tobacco, and Firearms. These fireworks are all classified under the Department of Transportation under UN0333, UN0334, and UN0335, and must be transported under the guidlines set aside for fireworks. To be in possession of such fireworks, one must have procured an ATF Federal Explosives License in compliance with 27 CFR, Part 555. Aerial devices containing 130 mg. or less of flash powder. While commercial fireworks are not regulated by the ATF, they are still classified by the Department of Transportation as products UN0336 and UN0337, and any person manufacturing consumer fireworks for commercial use MUST obtain a Federal Explosives Manufacturing License. These particular devices are pyrotechnic devices manufactured for professional use. They are similar to commercial fireworks in chemical composition and construction, but are not intended for consumer use. These devices also fall under the regulation of 27 CFR 555.11. The Code of Federal Regulations (CFR) has a five type distinction for the storage of explosives. All of these distinctions of type are governed by the storage rules as laid down in CFR Part 555.206 (Location of magazines), CFR 555.207 (Construction of Type 1 Magazines),CFR 555.208 (Construction of Type 2 Magazines), CFR 555.209 (Construction of Type 3 Magazines), CFR 555.210 (Construction of Type 4 Magazines), CFR 555.211 (Construction of Type 5 Magazines), and CFR 555.213 (Quantity and Storage Restrictions). Type 1 Magazines: Permanent storage for high explosives. Subject to CFR 555.206 and CFR 555.213 limitations. Other classes of explosives may also be stored. Type 2 Magazines: Mobile or portable indoor and outdoor storage for high explosives subject to limitations under CFR 555.206, CFR 555.208, and CFR 555.213. Type 3 Magazines: Portable outdoor magazines for storage of high explosives while attended (ex: a “day box”), subject to limitations for CFR 555.206, and CFR 555.213. Other classes may also be stored. Type 4 Magazines: Low explosives. Subject to the limitations presented by CFR 555.206, CFR 555.210, and CFR 555.213. Detonators that will not mass detonate may also be stored. Type 5 Magazines: Blasting agents. These agents are subject to CFR 555.206, CFR 555.211, and CFR 555.213. The aviation industry is rife with numerous chemicals, compounds and materials that qualify as either “flammable”, or “combustible” , or “explosive” according to The National Fire Protection Association standard 30 (NFPA 30). According to NFPA 30, a “flammable” liquid is any chemical that has a flashpoint below 100 degrees Fahrenheit, while a “combustible” liquid is any chemical that has a flashpoint above 100 degrees Fahrenheit. The most commonly encountered NFPA 30 chemicals that are encountered in the aviation industry are; acetone, ammonia, asbestos, carbon monoxide, chlorofluorocarbon 113 (CFC 113), ethylene glycol, methylene chloride, and methyl ethyl ketone (MEK). More chemicals can be found for all industries listed on the Materials Safety Data Sheet (MSDS), which should be on site at any facility storing any of the 0ver 4,000 chemicals listed on this list. Aviation chemicals may be stored by four separate methods; aboveground tanks, below ground tanks, storage tank buildings, and container / locker storage. All aviation chemicals to be stored in a container / locker MUST adhere to NFPA 30 Sec. 9.5.3 which states that a “flammable storage cabinet” must be designed to limit the internal temperature of the container / locker to no more than 325 degrees Fahrenheit from the center of the cabinet to within 1” of the top of the cabinet when subject to a 10 minute fire test. 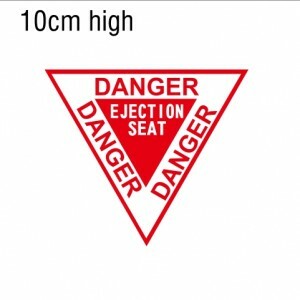 Certain materials used in aircraft ejection seats may be required to be stored in qualified storage magazines, day boxes or Type 2, Type 3 or Type 4 cabinets and boxes. These may include cartridge activated explosive devices, boosters, or impulse cartridges. Cartridges are typically stored where they are not exposed to direct sun or high temperatures, this generally means storage in a cool, dry place or storage magazine. Local jurisdiction will provide requirements for storage of percussion-fired cartridges. Acetone – Acetone is an organic compound that is extremely flammable. It is used as a solvent, and in the degreasing process. Primary aviation uses are in the area of painting and buffing of aircraft. Ammonia – Ammonia is a colorless compound of nitrogen and hydrogen with a very pungent odor. It’s primary uses in the aviation industry is the base ingredient in many aviation cleaning products. Asbestos – Asbestos derives from a group of chemicals occurring naturally in the environment that can be separated into thin, durable threads. These threads are resistant to heat, fire, and chemicals, and do not conduct electricity. Prior to the 1980s, asbestos was found many places in the aviation industry including the engine, insulation, brakes, cockpits, heating systems, heat shields, torque valves, gaskets, electrical wiring, and insulation. Once the carcinogenic effects of asbestos were thoroughly examined, the aviation industry began to phase out the product. It is not very rarely found, and then predominantly in adhesives and epoxies. Chlorofluorocarbon 113 – (CFC 113) CFC 113 s a organic compound formed from carbon, chlorine, and fluorine, and is produced as a volatile derivative of methane, ethane, and propane. CFC 113 is commonly known by its DuPont trademark name “Freon.” CFC 113 is used in aviation primarily as a refrigerant. Use of CFC 113 was severely curtailed in the 1980s when its negative effects on the ozone layer were discovered. Ethylene glycol – Ethylene glycol is a colorless, odorless, sweet tasting syrup that is used in the manufacture of polyester fibers and antifreeze. It is used in aviation primarily as the main component for de-icing fluid. Methylene chloride – Methylene chloride (commonly known as Dichloromethane, or “DCM”), is a colorless, odorless, volatile organic compound with a moderately sweet aroma that is predominantly used as a solvent. The primary uses of DCM in the aviation industry are as a paint stripper, degreaser, and aerosol propellant. Methyl ethyl ketone (MEK) – MEK (commonly known as butanone) is a colorless organic compound with a sharp, sweet odor reminiscent of butterscotch and ammonia. It is commonly used as a solvent, and plastic welding agent. Its primary use in aviation is as a cleaner for bare metal surfaces. 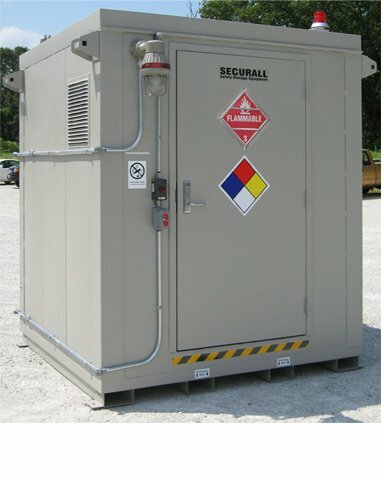 There are a wide variety of ammonia based materials, compounds and products that require secure, safe and OSHA Approved or ATF Approved storage cabinets and storage buildings. Whether your needs are for the job-site or need to be mobile or simply need cabinets for the storage of mining, blasting or quarry materials, we can help. 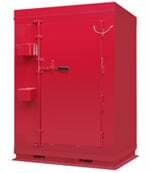 Our full line of OSHA Approved Storage Buildings and ATF Storage Magazines are designed to meet your exact needs. We can also custom build a solution that is right for your storage requirements. AMMONIA – Ammonia is a colorless, odorless compound of nitrogen and hydrogen gas intended for use as a fertilizer. Ammonia is shipped under pressure as a liquid. In any form, ammonia is corrosive to aluminum, tin, copper, lead, silver, zinc, and their alloys. AMMONIUM NITRATE – Ammonium nitrate is a prill used extensively in the mining industry as a solid oxidizer ingredient for explosive compositions. Ammonium nitrate is very soluble with water and does not precipitate with any other common chemicals. Ask us how we can help you with Storage of Ammonium nitrate. AMMONIUM NITRATE LIQUOR (ANL) – Ammonium Nitrate Liquor is a clear, colorless liquid that is heated to greater than 225 degrees fahrenheit to keep salt dissolved in a solution. ANL is infinitely soluble in water, and does not precipitate with any common chemical. ANL is predominantly used in the mining industry. AQUA AMMONIA – Aqua ammonia is synonymous with ammonium hydroxide. Both distinctions are defined as a solution of ammonia in water. These high purity solutions are produced using demineralized water. Aqua ammonia can is a preferred form or ammonia for users who need to avoid storage of compressed gasses. This form of ammonia can be injected as a liquid and vaporized with the addition of heat into water vapor and gaseous ammonia. Aqua ammonia is also used as a base to neutralize acidic conditions. BLENDED NITRIC ACID (BNA) – Blended nitric acid is a clear and colorless (to slightly yellow) liquid that can come in varying strengths. BNA is created by oxidizing anhydrous ammonia over a platinum catalyst at extreme temperatures. The resulting gases (nitric oxide and nitrogen dioxide) are cooled and demineralized into water. BNA is used for nitration of organics for production in plastics, surface coatings, dyes, pesticides, and explosives. CARBON DIOXIDE LIQUID (CDL) – Carbon dioxide liquid is a colorless, odorless gas that is shipped under pressure as a liquid. This liquid absorbs readily into water to form carbonic acid, which is typically referred to as carbonated water. DIESEL EXHAUST FLUiD (DEF) – DIesel exhaust fluid is a urea solution produced by combining pure liquid urea with clean plant stem condensate to produce a desired concentration. DEF is marketed as an ultra clean liquid fuel for catalytic abatement of nitrogen oxide emissions. MIXED ACID – Mixed acid is a blend of strong nitric acid (98%) and oleum (sulfuric acid saturated with sulfur trioxide). Mixed acid is designed as a nitrating agent for industrial processes. Mixed acid reacts violently with oxidizable organic substances, to the point that ignition can occur. Mixed acid is used in the nitration of organics, as well as for production in plastics, surface coatings, dyes, pesticides, and explosives. REFRIGERATION AMMONIA – Refrigeration ammonia is a colorless, odorless gas that is shipped under pressure as a liquid. Refrigeration ammonia has a pungent odor that is irritating to the mucosal membranes of the eyes and lungs. Contact with refrigeration ammonia liquid can cause frostbite. Refrigeration ammonia absorbs readily into water to form alkaline ammonium hydroxide solution, which is used as a refrigerant. Refrigeration ammonia can be easily compressed into a liquid, and back into a gas. Refrigeration ammonia is corrosive to aluminum, tin, copper, lead, silver, zinc, and their alloys. UREA AMMONIUM NITRATE (UAN) – Urea ammonium nitrate is a solution created by dissolving amide nitrate salt in water. UAE produces a slight ammonia odor. It is predominantly used in fertilizer solution. UREA FEED GRADE (UFG) – Urea feed grade is a small spherical white solid that is easily decomposed to ammonia and carbon dioxide by heating, and is soluble in water. UFG is added to cattle feed to boost protein content. UFG may also be used as a slow release fertilizer. UREA PRILL – Urea prill is a small, spherical white solid that is soluble in water. It is suitable for use as an agricultural and forestry fertilizer, as well as having other industrial applications which require a high quality nitrogen source. UREA SOLUTION – Urea solution is a dissolution of pure amide directly into clear condensate so no ions of any metals are present. Urea solution is marketed as an ultra clean liquid fuel for catalytic abatement of nitrogen oxide emissions. Whether your operation us utilizing bulk or packaged Ammonium Nitrate, ANFO, Emulsions, ANFO/Emulsion Blends or other agents for mining, construction or quarry operations, we have a Storage Magazine (indoor and outdoor certified) to ensure you stay in compliance with ATF, OHSA or DOD safety standards. The Library below is meant for educational purposes on technical information of many explosives that our magazines are used for in compliance with safety & explosive hazards regulations. AMMONIUM NITRATE – Composed of the nitrate salt of ammonium, this white crystalline solid is highly water soluble. Ammonium nitrate is predominantly used in agriculture as a high nitrogen fertilizer. One other major use of ammonium nitrate is as an explosive in mining, quarrying, and civil construction. Ammonium nitrate is the main component of ANFO (ammonium nitrate / fuel oil), which accounts for 80% of all explosives used in North America. CAST BOOSTERS – Cast boosters are used to amplify the energy of a detonator. The booster acts as a conduit between a weak conventional detonator, and a low sensitivity explosive. (Ex: TNT). The most common form of cast booster is a cylindrical shell made of extruded or pressed cardboard or plastic which the explosive material has been cast into. 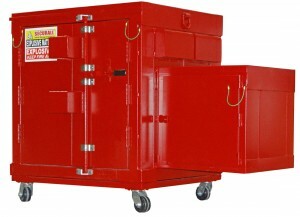 Safe and ATF compliant storage for High and Low Explosives in the workplace or worksite. DELIVERY SYSTEMS – A delivery system is a generic term used to describe the method in which an explosive charge is ignited. 95% of all explosives are delivered into the borehole by bulk loading methods. DETONATING CORD – Also known as a detonation cord, detacord, detcord, primer cord, or sun cord, the detonating cord is a thin, flexible plastic tube usually filled with pentaerythritol tetranitrate (PETN). The cord is a high speed fuse which explodes, rather than burning. Detonation cords are used for detonating high explosives, and act as a downline between the trigger and the blast area. ELECTRIC DETONATORS – An electric detonator allows a circuit to be tested before firing a shot. Electric detonators come in three categories; instantaneous electric detonator (IED), short period delay detonators (SPD), and long period delay detonators (LPD). The detonation of SPDs are measured in milliseconds, while the detonation of LPDs are measured in seconds. ELECTRONIC DETONATORS – Electronic detonators offer better precision for delayed ignition. These detonators are designed to provide precise control to produce accurate and consistent blasting results. Electronic detonators are primarily used in mining, quarrying, and construction. These detonators are programmed in one millisecond increments from 1 millisecond to 10,000 milliseconds. EMULSIONS – Emulsions are explosives composed of water in oil based explosives. Emulsion explosives are ideal for bulk loading both on the surface and underground. Emulsions are the most commonly used explosive based on ammonium nitrate / fuel oil (ANFO) chemistry. These explosives are water resistant, and offer a higher bulk density. 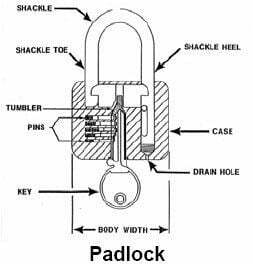 NON-ELECTRIC DETONATORS – Non-electric detonators are shock tube detonators used to initiate explosions. A hollow plastic tube delivers a firing impulse to a detonator instead of electric wires. This makes non-electric detonators immune to most hazards associated with stray electrical current. A non-electrical reaction travels at approximately 6,500 feet per second along the length of the tube with minimal disturbance outside of the tube. Storage magazines are used in the storage and transportation of both high and low explosives. This brief summary will focus on Type 2, 3, and 4 storage magazines. All of the magazines covered in this summary are rated to store both high and low explosives. High explosives are materials that will detonate. These include; blasting caps, detonating cord, dynamite, shaped charges, and boosters. Low explosives are materials that deflagrate, producing large volumes of heated gas. These include; black powder, display fireworks, safety fuse igniters, igniter cord, and fuse lighters. Type 2, 4 and 4 containers, buildings and portable dayboxes to meet your needs and budget price requirements. Type 2 magazines are manufactured predominantly for the storage of high explosives. These magazines are made for indoor or outdoor placement. As directed by the ATF, these magazines can not hold more than 50 lbs. of explosive materials. Outdoor Type 2 magazines must be built to bullet resistant design. Type 2 magazines are easily portable, and can be housed most places with a flat surface. 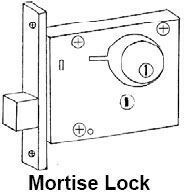 These magazines are built for turn-key installation, allowing for easy location. 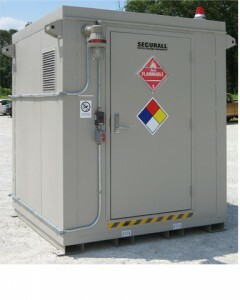 A prime example of a compliant Type 2 storage magazine is the Securall M200 Explosive Storage Magazine. Type 3 magazine storage containers are commonly known in layman’s terms as “Day Boxes.” These magazines are utilized mainly in the transportation of high and low explosives to sites in the field, and are to mean to be attended at all times. Per the ATF, “Explosive materials are not to be left unattended in type 3 magazines and must be removed to type 1 or 2 magazines for unattended magazines. Type 2 storage magazines are designed for the storage of low or high explosives. These magazines are made of steel, and are weather, fire, and theft resistant. Like its type 2 counterparts, a type 4 magazine is made for indoor, outdoor, portable, or mobile use. However, a type 4 magazine can also be used in a permanent location. Larger units of type 4 storage magazines are manufactured with I Beam supports running the length of the structure, and the magazines can be drug along surfaces by the end of the I Beams. These magazines can also be equipped with fork channels and casters to make relocation even more simple. It should also be noted that 1.3G display fireworks (formerly Class B fireworks) that are for aerial display are to be stored in approved storage magazines. Whether these are for pyrotechnics storage or ATF 54 licensed persons requiring day boxes, our full line of fireworks storage containers and solutions are designed to meet your price point and budget. In the United States we have a long history of quality ammunition for military and recreational use. These explosives come in a variety of calibers, brands and sizes and are made by several reputable manufacturers here in the USA. Below is our full list of companies whose explosives are typically stored in Type 2, Type 3 or Type 4 storage magazines to ensure safety and ATF approved compliance. American aerospace, defense, and sporting goods. Manufacturer of ammunition for sport shooting, law enforcement, military, and security outfits. Ammunition sales division is solely regaled to the Vista Outdoor division. A wholly owned subsidiary of BAE Systems Plc. Design, development, and production of ammunition, artillery systems, naval guns, and missile launchers. Largest company of its kind in the world. No matter the brand of ammunition, proper storage of Ammunition in an ATF Approved Storage Magazine is essential to safety. Also known as Cascade Cartridge Inc., this company is known for the manufacture of rimfire ammunition, centerfire handgun ammunition, and primers for reloaders and industrial power loads. Producer of the 1st Mini-Mag rimfire ammunition in 1963. Developed the Stinger, a hyper velocity .22 long rifle product. Founded primarily for the manufacture of ammunition used in African big game hunting. Subsidiary of Alliant Techsystems. Manufacturer of shotshell, centerfire, and rimfire ammunition. Federal Premium Ammunition’s were used to help the United States to take the gold and silver in sharp shooting in the 1992 Summer Olympics. Extremely popular with law enforcement. Major distributor of smokeless powder for ammunition industry, as well as those who load their own ammunition by hand. in 2009, Hodgdon Powder Company acquired GEOX Powder, Inc., the only manufacturer of black powder in the USA. Also the manufacturer of Triple Seven, which is a modern substitute for black powder meant for muzzle loaders and antique firearms. Manufacturer of target shooting ammunition, hunting rounds, and high quality self defense loads. In 1990 the Hornady XTP (Extreme Terminal Performance) won the industry’s Product Award of Merit from the National Association of Federally Licensed Dealers. Caters to African game hunters, cowboy action shooters, and specialty gun builders. Produces 1.4 billion rounds of ammunition per year. This government owned company is responsible for ammunition and weapons testing as the officially designated National and Regional Testing Center for NATO. Largest producer of small arms ammunition for the United States Armed Forces. Consists of three divisions. (Nosler, Inc. / Nosler Custom / Nosler Reloading). Manufactures high performance hollow point and soft point bullets. Patented the “Partition Design Bullet”. Specializes in the distribution of various sizes of cartridges for designs of firearms with foreign origins such as AKM, AK47, and Makarov PM. The USA’s oldest gun manufacturer, this company has developed more cartridges than any other gun maker or ammunition manufacturer in the world. Manufactures over 175 different kinds of ammunition for precision target shooting, hunting, and defense purposes. A division of Winchester, this company manufactures primers, blasting caps, and rimfire cartridges.